I offer range of wedding photography package which provided a variety of coverage options. Hopefully one of them will be perfect for you. You can view them all here. If you’re looking for something a little different, you can always contact us me and I’ll be happy to help. The essential coverage captures the wedding ceremony and drinks reception. This is usually when the majority of your formal group photography will take place. For half-day coverage, you can choose to have either the bridal preparations captured through to the start of the wedding breakfast or from the ceremony through to the end of the speeches. And finally with all-day coverage, your whole day will be documented starting with the bridal preparations through to the end of the first dance, providing life long memories, telling the story of your wedding day with beautiful, creative, wedding photographs. View our Wedding Packages for further details. Below are some of the main questions wedding photography questions. Click on the headings to expand the questions. Once you have decided that Stewart is the photographer for you, Your date can be secured by the payment of a booking fee. A contractual booking form is also required signing at the same time. We can meet up for a chat and a flick through some sample albums, there’s plenty here for you to view. But if meeting before-hand isn’t possible, we can do everything online and by email. For further piece of mind, there are plenty of verified references available to view online. Wedding Photographers in Bristol. To book Stewart, a completed contractual booking form and a booking fee of £100 is required. Cheque, cash or online payment is fine. We can do this when we meet, or you can do it all securely online. Don’t forget to like me on facebook and keep in touch! Whenever you’re ready, we’ll meet up to talk details. Closer to the date, your plans for time and locations will be much clearer, so is ofter better to meet then. If you haven’t got in touch around a month before the wedding, I’ll be in touch. Remember summer weekends are really busy, so allow plenty of time. There’s no need to make it the same time of year or day as your wedding – conditions are not that predictable in this country! Depending on the time of year, between two and three weeks after the wedding, your photographs will be available online in a private gallery (You’ll receive an email as soon as they’re ready). You can give the gallery details to your friends and family so the can also enjoy viewing your photos. The option is also there for your guests to purchase prints. If you are having a disc only package, your images will be in the post shortly after. These are the high resolution, non-watermarked files ready for you to print yourselves. The actual number of photographs supplied varies. It’s typically between 300-700 depending on how long I’m with you for. But please don’t compare photographers based on how many photographs you get. It’s the stunning images within the collection that stay with you for life, and the creative coverage of all the events, details and emotions of the day that matters. Any idiot could give you 2000 terrible pictures! We’re ready to start designing as soon as you choose your album photos. Once the album design is completed (allow 2-3 weeks), you can either choose to see an online visual first or you can give the go ahead and have a lovely surprise seeing the finished album! As a guide, storybook albums take around 1 to 2 weeks for completion, and matted albums can take up up to 4 weeks as they are all individually hand crafted albums. The online visual of your album is to offer you piece of mind that your album will be amazing! Occasionally couples ask to make a few picture swops, that’s fine. But please understand that a lot of hours have gone into the design, ensuring that each spread is balance right. The album visual isn’t a proof for you to start changing. How about a ‘Photo Booth’ during your evening party? 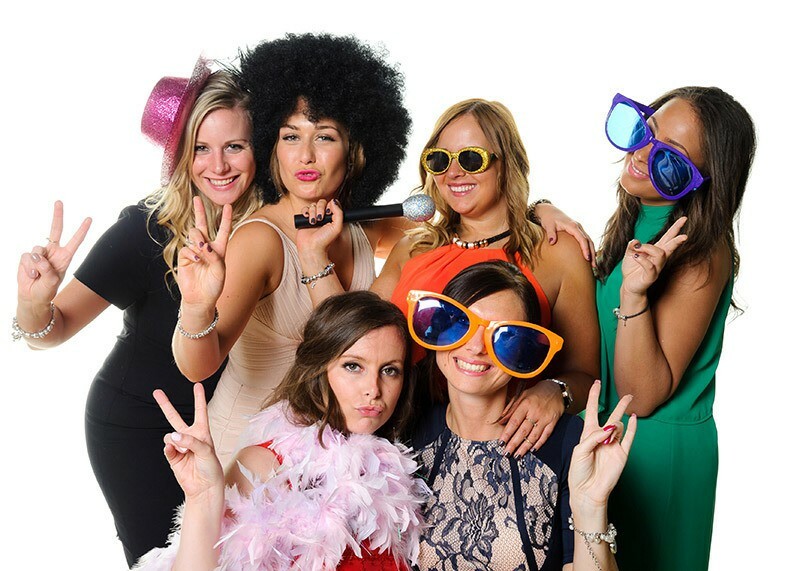 For extended evening coverage, a studio setup (aka photo booth) can be available to capture professional ‘studio looking’ (formal and fun) photographs of you and your guests – another great way to capture photographs of your friends and family! For added fun, props are available (dress-up items, wigs, mustaches, glasses etc.) – get away from the formal shots and allow your guests to have some fun – great wedding entertainment and and even more delight for you when browsing your photos! The Photo-Booth option can be added to any package which includes coverage of the First Dance and is usually available for an hour afterwards providing extended coverage. Our wedding photography packages also offer a variety of wedding albums. Below are some brief descriptions of each style. 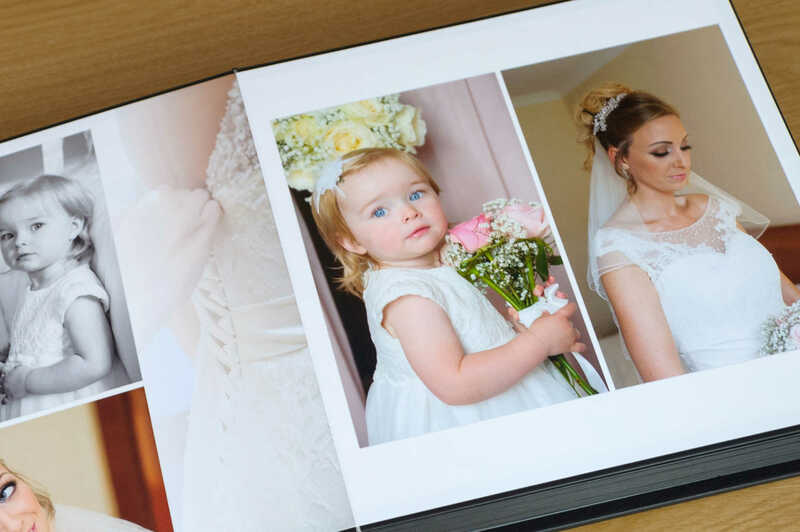 You can also take a look at our Wedding Albums page for further details including example page designs and cover options. The Album Box Set is the perfect box set duo for your wedding day photographs and images. This new storybook wedding album is presented in a personalised matching box case, along with a matching USB. There’s also an exclusive edition, which offers even more customisation! The Perfetto Albums are true to its name, ‘simply perfect’! They offer a seamless flush mounted design across the spreads. Cover options including acrylic photo cover & engraved brushed aluminium. The pages made using traditional photographic paper. The Artbook Albums are similar to the Perfetto with seamless page designs, but are cleverly bordered with a traditional style taped edge which further enhances the storybook page layouts. The pages also feature metal corners for further style and protection. Jorgensen Contemporary Albums are bespoke and made to order allowing you to choose the covering finish from a selection of colours and textured materials including leathers and gloss wood finishes. The covers can also feature an acrylic front picture to further enhance it’s look. 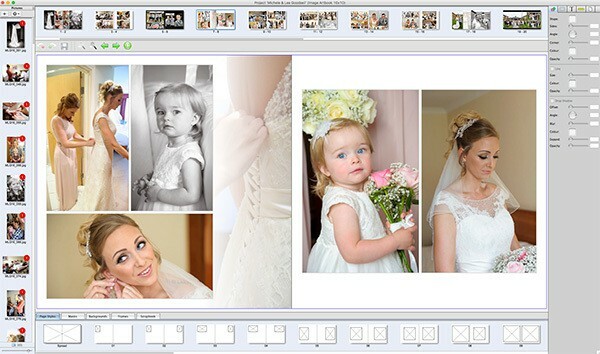 The pages are designed with a mixture of single and multi-aperture mat overlays (standard, twin or bevelcore mats). Jorgensen albums can be tailored to create your unique dream wedding album.